This entry was posted in GR and tagged ειδήσεις on May 12, 2012 by FEMEN. This entry was posted in GR and tagged ειδήσεις on April 10, 2012 by FEMEN. This entry was posted in GR and tagged ειδήσεις on April 2, 2012 by FEMEN. This entry was posted in GR and tagged ειδήσεις on March 31, 2012 by FEMEN. "Πυροβολήστε, ευνουχίστε και ταΐστε στα σκυλιά τους βιαστές μου"
This entry was posted in GR and tagged ειδήσεις on March 20, 2012 by FEMEN. 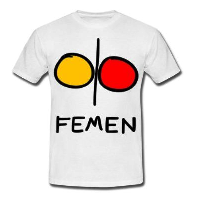 This entry was posted in GR and tagged ειδήσεις on March 12, 2012 by FEMEN.